For many of us, home is where our best furry friends are. Our one and two bedroom apartments welcome your pets. 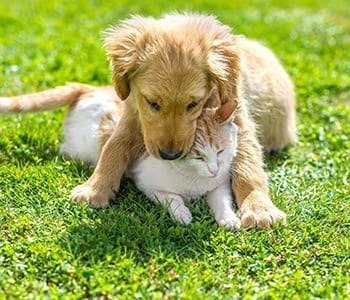 We are delighted to have you and your dog or cat become part of our friendly community. There are plenty of cozy corners and sunny windows in our interiors for a catnap or some quality bird watching. Getting out for a walk is a pleasure in our on-site Bark Park. For offsite fun, enjoy an on-leash hike at Lost Dog Wash trailhead or join the dog party a few minutes away at Horizon Dog Park. Cabrillo Apartments offers deluxe apartment living for both people and pets. Give us a call or drop by to learn more about pet-friendly apartment living at Cabrillo Apartments in Scottsdale, AZ.